The ex-Ayrton Senna, record-setting, final Monaco Grand Prix-winning, 1993 McLaren-Ford MP4/8A Formula 1 racing single-seater is to be offered at Bonhams Monaco sale on 11 May and will be on view at Le Grand Palais, Paris on 6-8 February. This startlingly well-preserved, running-order Formula 1 car won the 1993 Monaco Grand Prix – 25 years ago – in the hands of the legendary Ayrton Senna. The Brazilian three-time Formula 1 World Champion Driver, rated by many as the greatest of all time, won a record six editions of the prestigious round-the-houses Monaco Grand Prix. 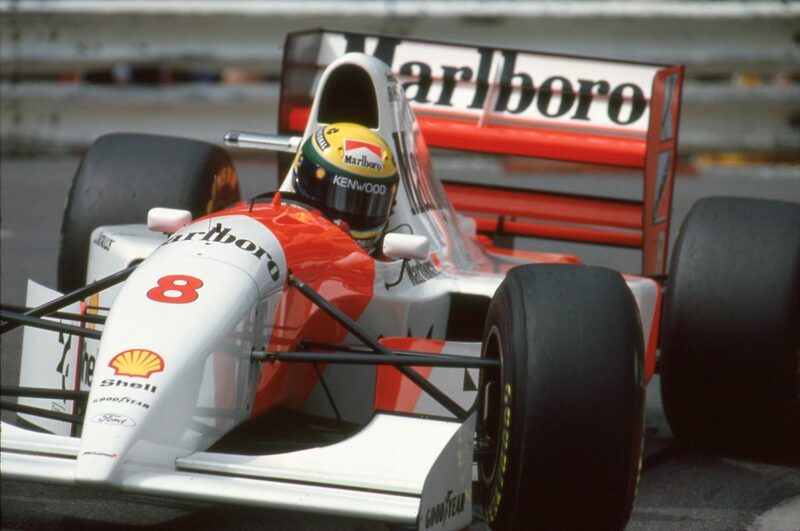 The 1993 season was Senna’s last with McLaren. The great team had just ended its long and successful partnership with Honda for engine supply, and would link up with Peugeot in a new Formula 1 racing partnership from 1994. For the interim 1993 season, a last-minute agreement had been struck with Ford to run their Cosworth-built ‘HB’ V8 engines on loan. Ayrton Senna was initially sceptical that these compact Ford V8 engines would be able to compete with the dominant Renault V10s as deployed by the Williams team, led by the Brazilian’s former team-mate and deadly rival Alain Prost. Ayrton drove this actual car – McLaren-Ford MP4/8 chassis number ’6’ – in no fewer than eight of the 1993 season’s Formula 1 World Championship-qualifying Grand Prix races. In his debut with the brand new car at Barcelona’s Spanish Grand Prix, he immediately finished 2nd overall, headed only by Alain Prost’s Williams-Renault. For the following Monaco Grand Prix, he experienced an apparent problem with the car’s ultra-modern ‘active’ suspension system during qualifying which sparked a violent crash into the barriers at Ste Devote corner. The incident unfolded so suddenly that even Senna was unable to let go of the steering wheel in time, and the impact painfully injured his thumb. Chassis ’6’ was then repaired in time for Saturday running, and he qualified third fastest and went on to win his 6th Monaco GrandPrix. The McLaren MP4/8 was a Formula One racing car which competed in the 1993 season. It raced in all sixteen Grands Prix, scoring five wins. The engine was a Ford HBD7 3.5 V8. Thanks to a watershed use of electronics technology that cars used in the 1993 season, the car was designed by Neil Oatley around advanced electronics technology, including a semi-automatic transmission, active suspension and traction control systems that was developed in conjunction with McLaren shareholder Techniques d’Avant Garde (TAG). The car was driven by triple World Champion Ayrton Senna in his 6th season with McLaren and American CART driver Michael Andretti, the son of the 1978 World Champion Mario Andretti, who was entering into his first (and ultimately only) season in Formula One. Andretti was replaced after the Italian Grand Prix by the teams test driver Mika Häkkinen. Price: Estimate to come, waiting on the auction house.